When I encountered Jan Drexler's Hannah's Choice it seemed as good a time as any to dip my toe back into the world of literary Amish. 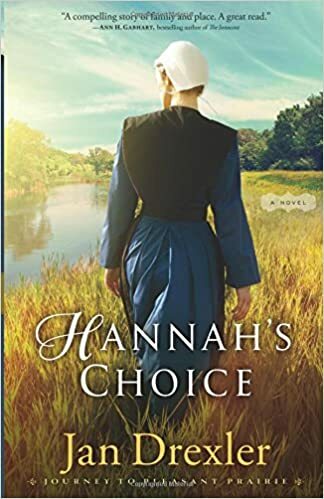 Hannah's Choice follows the story of a young Amish woman named Hannah whose family finds themselves at a crossroads. Their county has undergone vast changes with the arrival of new neighbours from a variety of faiths (Quaker, Mennonite, Methodist, etc), the arrival of the abolitionist movement, and the changes and losses which have shaped the Yoder's themselves over a difficult decade. Rather than risk the temptation of an increasingly modern and varied county, Hannah's father decides to move west with two other families in an effort to give his family the chance to live a life faithful to Amish beliefs. For Hannah, this merely increasing the pressure to find her place as she finds herself torn between past and future, friends and family, and everywhere in between. Overall, Drexler presents a fun and well rounded story for fans of the Amish fiction genre. Her characters are developed and are believable in their roles from Hannah's coming of age quandaries and her desire to determine what it means to be faithful to Annalise and Christian's worry for their children. The plot had enough storyline to be engaging between the isseus surrounding the move, Hannah's choice between Adam and Josef, and Liesbet's rebellion. The setting was serene and I could easily picture myself walking through the woods as I read. That said, I simply couldn't muster up any excitement over this book. The dialogue, the religious quandaries regarding the Bann, the struggle to remain Amish held no connections for me personally and the story itself wasn't able to rise out of it's setting enough like some others in the genre to pull me in regardless of the genre. It was too locked in. I received this book for free in exchage for my honest opinion through Nuts About Books, The opinions expressed are entirely my own.